They have pungent or sour post digestive effect (vipaka). Vipaka is the way the food affects you when completely absorbed and assimilated. 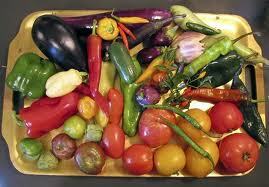 In the case of nightshades your colon is experiencing sour and pungent taste. It can be irritating for all three doshas. Sour is heating and irritates Pitta. Pungent is heating and drying and affects both Vata and Pitta. Kaphas can tolerate them in small amounts once or twice a month. They contain solanines, which are responsible for nervous system disorders. They dehydrate the joints and worsen arthritis. They worsen acidity, sciatica, and kidney and gallstones disorders. I found out that yams and sweet potatoes can be substituted for white potatoes almost in every dish. They are yummy and have sweet post digestive effect which is beneficial and calming to the body. Red tomatoes are better than the yellow or green ones. The tomatoes seeds have a concentrated amount of the nightshade energy. The seeds of raw tomatoes can even cause abdominal pain. If you “have” to eat nightshade vegetables they should be not raw (tomatoes too) but cooked with cumin, turmeric, and mustard seeds to lessen their toxic effect. TODAY’S TIP: What to do if you like tomatoes just like I used to? Cut back one quarter of the amount you normally eat and continue with three quarters until you feel comfortable to cut back another quarter and so on. I have allergy to nightshades.recent I dijested gensing in soup and in a beverage. Broke out in hives. Is gensing considered nightshade family? Gensing belongs to the Araliaceae family while the night shade group is a part of the Solanaceae family.